Chevron has never appeared to take seriously its potential liability for the 18 billion gallons of contamination intentionally dumped in the Amazon rainforest. The oil company continually dismisses the overwhelming evidence that shows ChevronTexaco is responsible for destroying the health and way of life of the indigenous groups and farmer communities that live there. But, despite the company's failure to account for the severity of its actions, you couldn't imagine they found the situation humorous. Perez Pallares, in a dismissive, mocking tone said: "And it's the only case of cancer in the world? How many cases of children with cancer do you have in the States? [laughter] If there is somebody with cancer there, [the Cofan parents] must prove [the deaths were] caused by crude or by petroleum industry. And, second, they have to prove that it is OUR crude – which is absolutely impossible." For his part, Jaimie Varela waved away concerns about instances of childhood cancer, asking Palast if he has been given any medical reports. When the reporter showed Varela a peer-reviewed study indicating that instances of childhood leukemia were substantially higher in the contaminated region, Varela mocked it. The tape demonstrates a sickening display of callousness and arrogance that seems to be at the heart of Chevron's legal strategy. It is clear that Chevron would not be so quick to laugh at those dying off from their failure to act as an ethical corporation if the victims were from another part of the world. Sadly, the lawsuit has exposed not only a history of environmental racism by the oil giant, but has demonstrated Chevron's ongoing belief that human life is of less value amongst the impoverished communities in Ecuador's rainforest. Chevron attempting to pass the buck to Ecuador? Chevron Corp. is stepping up its offensive in its long-running legal battle in Ecuador, suing Ecuador's government under international trade law. Chevron is the defendant in a multibillion-dollar lawsuit that seeks to hold the company responsible for environmental damage allegedly caused by Texaco Inc., which Chevron bought in 2001. Chevron has denied the allegations. Ecuadorean community leader Luis Yanza protests following a Chevron shareholders' meeting at the company's headquarters in San Ramon, Calif., last year. A lawsuit accuses Chevron of environmental damage in Ecuador. Seeking to protect itself from what it says is likely to be an adverse ruling in Ecuador, the California-based oil giant said Wednesday it had filed suit under the terms of a 1997 trade pact between the U.S. and Ecuador. The suit amounts to a request for arbitration through a process set up by the United Nations Commission on International Trade Law to adjudicate disagreements. The arbitration process is separate from the original lawsuit, which will continue. But under its pact with the U.S., Ecuador must accept the arbitrators' rulings as binding under international law. In its filing, Chevron argues Ecuador's government is responsible for any environmental damage and should pay any penalties assessed in the lawsuit, which could total $27 billion, according to a court-appointed expert. Chevron also asks that arbitrators force Ecuador's government to pay the company's legal fees and to award "moral damages" due to the government's alleged interference in the case, intimidation of Chevron representatives and other "outrageous and illegal conduct." The move seeks to capitalize on the release last month of videos that Chevron says reveal a bribery scheme possibly involving the Ecuadorean judge who has been overseeing the lawsuit. Ecuador says it is investigating Chevron's allegations, as well as any potential involvement by Chevron in the scheme. The judge, who has sought to recuse himself from the case, has denied any wrongdoing, and the videos don't show him accepting or soliciting a bribe. On Tuesday, a local court ruled that the judge's withdrawal petition was "unfounded" and ordered him to stay in the case. Chevron believes the controversy has given new weight to its claim that it cannot get a fair trial in Ecuador. "We have believed for some time that it would be impossible for Chevron to get a fair hearing in Ecuador," Chevron General Counsel R. Hewitt Pate said. 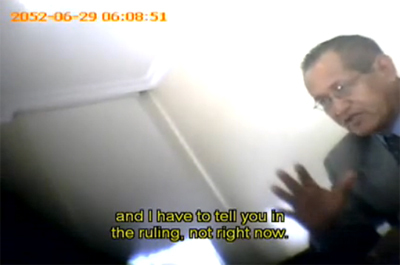 Eric Bloom, a U.S. attorney representing Ecuador in the dispute, said Chevron has been trying to discredit Ecuador's judicial system for years, and he questioned the videos' authenticity. "Chevron either got very, very lucky on the eve of a verdict and actually tripped across a legitimate concern, or they helped to stage-manage a fictitious event," Mr. Bloom said. "Both possibilities have to be investigated." Chevron has denied doctoring the videos or participating in the scheme and has said it took steps to verify the videos' authenticity. Steven Donziger, an attorney for the plaintiffs in the original lawsuit, said the filing will have "minimal impact" on his case, but he said it is a sign Chevron is becoming desperate. The plaintiffs in the lawsuit couldn't immediately be reached for comment. Chevron's decision to seek international arbitration is the latest example of the company's increasingly aggressive strategy in the case, which includes a Web site to rebut plaintiffs' claims and an effort to lobby Congress to revoke Ecuador's trade privileges because of the government's alleged interference in the dispute. Since Chevron has almost no assets in Ecuador, the plaintiffs will have to seek enforcement of any ruling in their favor in the U.S. or another country where Chevron operates. Separately, the international arbitration process could take years. In its arbitration filing, Chevron claims that by allowing the lawsuit to go forward, the Ecuadorean government is violating a 1998 agreement that released the U.S. company from environmental liability in return for a $40 million cleanup paid for by Texaco. The plaintiffs, a group of Ecuadorean residents, argue their case has nothing to do with the Ecuadorean government, so the agreement doesn't apply to their lawsuit. Ecuador's government says it has no control over the judicial process, although Chevron has argued the Ecuadorean judiciary is heavily influenced by President Rafael Correa. If arbitrators reject Chevron's argument, it could make it harder for the company to fight enforcement of an adverse ruling. But if arbitrators agree that Chevron has no liability, legal experts said, it will be very difficult for plaintiffs to collect on any damages outside Ecuador. Corporations have increasingly turned to international arbitrators in recent years to resolve disputes with governments. Companies often see the arbitration process as fairer than local courts. Multinational corporations, including energy companies, have increasingly turned to international arbitrators in recent years to resolve disputes with governments. Companies often see the arbitration process as fairer than local courts. But Andrea Bjorklund, a law professor at the University of California, Davis, said companies actually lose slightly more than half of their arbitration cases. "By no means is it a given that (a company) is going to prevail," Prof. Bjorklund said. "They have suffered a series of consecutive legal defeats in courts in courts in both the United States and Ecuador, which is forcing them to search for an international forum that they think will be more sympathetic," Mr. Donziger said. The entire, original online version of the article is included in a PDF here. As corporate values statements go, there are few more stirring than the "Chevron Way" espoused by the nation's third largest corporation. Chevron aspires to be "the global energy company most admired for its people, partnership and performance," one that conducts business "in a socially responsible and ethical manner," and "respects the law, supports universal human rights, protects the environment and benefits the communities where we work." That's heady stuff. Like most corporations today, Chevron has worked hard to learn the lessons of the corporate and social responsibility movement. It spends significant sums of advertising dollars marketing itself as an environmentally sensitive company. No matter how one might feel about oil companies, most entrepreneurs would agree that Chevron has every right to turn a robust profit--as long as it conducts itself in an ethical, legal and responsible manner consistent with its own high-minded rhetoric. Yet for all the nice words, Chevron's actions--and values--have not always been so responsible. In fact, there is increasing evidence that some of those actions have been downright harmful to the environment and continue to create health risks for thousands of men, woman and children. Which brings us to Ecuador. Ecuador is where Chevron currently faces a potentially $27.3 billion financial liability in a long-running legal case over the consequences of Texaco's alleged sub-standard operational practices in the Amazon rainforest. In 2001, Chevron acquired Texaco. And evidence in the lawsuit, plaintiffs say, demonstrates that from 1964 to 1992 Texaco deliberately dumped billions of gallons of toxic waste into Amazon waterways, abandoned more than 900 unlined waste pits, burned millions of cubic meters of noxious gases, and spilled more than 17 million gallons of oil due to pipeline ruptures. A court-appointed special master who conducted a damages assessment found that 173 out of 196 former waste pits operated by Texaco and inspected during the trial are contaminated with petroleum hydrocarbons in violation of Ecuadorian standards (each of Texaco's 356 well sites in Ecuador had multiple waste pits.) One plaintiff's expert said he believes cleaning this mess would be one of the largest decontamination efforts ever attempted. And the plaintiffs have presented evidence that Texaco acted knowingly. An extraordinary memo dated July 17, 1972, from R.C. Shields, then-head of all Latin American production for Texaco, issued a blunt directive to Texaco's acting manager in Ecuador: "No reports are to be kept on a routine basis, and all previous reports are to be removed from field and division offices and destroyed." Good corporate citizens don't demand that reports documenting environmental damage be destroyed. In 1992, on the eve of its departure from Ecuador, Texaco quietly hired two outside consulting firms to assess the environmental impact of the company's practices. The audits, which were submitted by Chevron as evidence, found that hydrocarbon contamination "requires remediation at all production facilities and a majority of the drill sites," that "produced water was disposed of into a local creek or river or in some instances directly into the jungle," and that in general, "spills of hydrocarbons and chemicals were not cleaned up." One report found that well site spills occurred at 158 of the 163 assessed sites. It also found, shockingly, that under Texaco's watch, prior to 1990 no spill prevention methods were in place, little maintenance had been done on any of the pits, and there was no groundwater monitoring to assess contamination. There is also a living record of the contamination from witness testimony: the indigenous people and campesinos of the region, whose children bathed in, played in and drank petroleum-laced water. Evidence has been presented from peer-reviewed academic journals that post-Texaco life on the Amazon saw cancer rates--including childhood leukemia--three times higher than rates in the rest of Ecuador. There is also evidence of elevated rates of miscarriages due to exposure to oil contamination and extensive anecdotal evidence of birth defects. After visiting the region last year, U.S. Rep. James P. McGovern wrote in a letter to President Barack Obama, "As an American citizen, the degradation and contamination left behind by this U.S. company in a poor part of the world made me angry and ashamed." Douglas Beltman, a former EPA official who serves as a scientific consultant to the affected indigenous groups, summarized the problem succinctly: "Texaco treated Ecuador's Amazon like a garbage dump. Almost everything an oil company could do wrong, Texaco did do wrong." With the complaints about contamination ignored, I and several other lawyers filed a lawsuit in 1993 on behalf of thousands of affected Ecuadorian citizens. The case was filed in New York federal court, within miles of Texaco's corporate headquarters. The objective was to compel the company responsible for what has been called the "Amazon Chernobyl" to pay for a clean-up. Texaco fought for nine years to move the case to Ecuador, filing 14 sworn affidavits asserting that the country's courts were a fair and adequate forum. In 2002, Texaco--by then, ChevronTexaco (and since renamed, simply, Chevron)--won that battle on the condition that it accept jurisdiction and abide by any ruling in Ecuador. In May 2003, the Amazon communities re-filed the lawsuit in Ecuador. Over the course of the long trial, more than 60,000 soil and water sampling results culled by the parties and an independent expert have been tested by independent laboratories. These results have then been re-confirmed by yet other independent sources, including a court-appointed special master and U.S. scientists who formerly worked for the EPA and Department of Justice who consult with the local communities. The results show extensive toxic contamination in soils at 100% of Texaco's former well sites. As the scientific evidence against Chevron mounted, the company went on the attack. It attacked the trial process as unfair--even though it had signed off on the process. It attacked the Ecuadorian judge as corrupt--even though it had filed countless affidavits praising Ecuador's judiciary. It hired lobbyists in Washington to bring pressure on Ecuador President Rafael Correa to quash the case. It promised decades of litigation to prevent a final judgment. In short, Chevron did everything it could to undermine the court system that it had previously praised. Chevron then tried to shift the blame to Petroecuador, Texaco's consortium partner from 1964 to 1990 and Ecuador's state-owned oil company. Yet records in evidence show that Texaco was the sole operator in Ecuador--exclusively designing, installing and running the massive operation. Internal company documents from the discovery process demonstrate Texaco made all significant production and business decisions, even down to how much could be spent to purchase a file cabinet. It is customary in the oil industry for the operator of oil fields to bear 100% of the responsibility for environmental contamination--and to be compensated for the additional risk. Chevron also claims it is not liable because in 1995 it paid $40 million to "clean" a portion of the well sites and waste pits in exchange for a release from liability from Ecuador's government. Interestingly, Chevron received the release before remediating a single site. Evidence at trial submitted by the plaintiffs demonstrates that Texaco's purported clean-up ignored the contaminated groundwater, rivers and streams, and consisted primarily of dumping dirt over waste pits without adequately cleaning out the toxins--akin to treating skin cancer with make-up. Evidence submitted by the plaintiffs shows that one well site, Lago Agrio 2, today has levels of TPH 3,250 times higher than allowed in the U.S. and 325 times higher than allowed under Ecuadorian law even though it had been certified by Texaco as "remediated" to secure its release. Worse, two former Texaco lawyers (now Chevron employees) and seven former Ecuadorian government officials are under criminal indictment in Ecuador for allegedly lying about the clean-up. Chevron announced this sad fact in its own press release. On Forbes.com recently, writer Silvia Santacruz rolled out the latest of Chevron's counter-attacks: that Ecuadorian President Rafael Correa has publicly supported the plaintiffs and made a fair trial impossible; that plaintiff attorneys have made a career out of pursuing Chevron; and that this is really just a case of radical environmentalism at work. What Chevron doesn't say is that it has been afforded more due process rights than probably any defendant in the history of environmental litigation. The company has submitted more than 100,000 pages of evidence and more than 50,000 chemical sampling results to the court, most of which were found by the special master to corroborate the allegations of the plaintiffs that the company's former well sites pose a high risk to human health. The indigenous communities already have waited 16 years for a resolution of their claims. At the end of August, the case took its strangest turn yet, when Chevron claimed it had video footage implicating the Ecuadoran judge presiding over the trial in a "$3 million bribery scheme." "Except," as Han Shan editorialized on the Huffington Post, "it didn't. The company revealed videos showing a former Chevron contractor named Diego Borja and an American businessman named Wayne Hansen, who appear to be trying fruitlessly to entrap the presiding judge, Juan Nunez." As the Financial Times pointed out in a Sept. 1 article, "The judge refuses several times on the tape to reveal the verdict, before saying, 'Yes sir,' when asked if he will find Chevron guilty. Nonetheless, the video begs the question whether Judge Nunez understood what he was being asked." The Ecuadoran government says it will investigate, and Nunez has recused himself from the case for any appearance of impropriety. But, as the Los Angeles Times put it in an editorial, Ecuador's government "should probe not just the judge's actions but those of Chevron." While claiming to have no role in the sting operation, Chevron admits it paid for the relocation of Borja and his family to the U.S., and provided support. It has also admitted that it had the videotape in its possession since June, but didn't notify American or Ecuadoran officials before its media blitz. And, equally suspicious, Chevron has not allowed reporters covering the story to speak with either Borja or Hansen about the incident--which, in Shan's words, "raises more troubling questions about Chevron than about the judge or Ecuador's judicial process." In the meantime, the U.S. Supreme Court and U.S. federal trial courts have dealt Chevron five consecutive defeats in the company's attempt to shift the liability to Petroecuador. New York Attorney General Andrew Cuomo--at the request of several Chevron shareholders, including the state's pension fund--has launched an investigation to determine whether Chevron is misleading the financial markets about the risk it faces in Ecuador. And an award-winning independent documentary by Joe Berlinger, Crude, will land in theaters in September. The humanitarian crisis could be quickly addressed if Chevron chose to clean up its mess, as any responsible company would do. Instead, it has decided to violate the values in the "Chevron Way" and reach into its deep pockets, to litigate indefinitely because it is cheaper than funding a clean-up. It has told shareholders it will not pay even if found guilty--a brazen sign of disrespect for the law that not only violates Chevron's previous obligation to a U.S. court, but also damages the image of the United States throughout Latin America. And all the while, Chevron is running ads singing the praises of its environmental and human rights practices. Until Chevron addresses the consequences of Texaco's rogue behavior in Ecuador, besmirching its reputation and giving American companies a bad name will be the real meaning of the Chevron Way. Steven Donziger, a New York lawyer, represents Ecuadorian plaintiffs in their suit against Chevron. If you can't win the argument, change the subject. That seems to be oil giant Chevron's strategy, as it battles a lawsuit for massive contamination of the Ecuadorian Amazon. After 16 years in litigation, a monumental environmental lawsuit by 30,000 indigenous people and campesinos against Chevron appears to be drawing to a close. The oil company has publicly said that it expects to be found liable for up to $27 billion in damages for what has become known as the 'Amazon Chernobyl.' And in less than a week, a high-profile documentary film about the case- acclaimed filmmaker Joe Berlinger's CRUDE- comes out in U.S theaters. On Monday, Chevron breathlessly declared that it had video footage implicating the judge presiding over the trial in a "$3 million bribery scheme." The closest the conversation comes to the suggestion of bribery happens when Hansen at one point abruptly asks the judge, "Do you want part of, of my contract?" The judge responds, "I don't have anything to do with that." Then Hansen appears to correct himself, and says he's talking about money that would go to the government, not the judge. Borja and Hansen also ask him several times whether he will rule against Chevron, and he repeatedly tells them they must wait for the verdict to find out. These excerpts are from Chevron's transcript. Hansen: They've been the guilty party for more than many years, right? Nuñez: You'll see that, sir. What you want to find out is whether it's going to be guilty or not, I'm telling you that I can't tell you that, I'm a judge, and I have to tell you in the ruling, not right now. But as Nuñez prepares to leave the meeting, Hansen asks him again. Hansen: Oh, no, I, I know clearly how it is, you say, Chevron is the guilty party. A ha! He said yes! He said yes! Gotcha! Predetermination! Corruption! Disqualification! Except that if you watch the video, Hansen's tortured Spanish statement about Chevron being el culpable - the guilty party- comes as people are shuffling papers and preparing to leave the room. It's not at all clear who the judge is answering or speaking affirmatively to. You can't see the judge when you hear his muffled "yes, sir" and one gets the sense that he's just trying to finish up this meeting that he apparently attended as a favor to an acquaintance. And that's Chevron's smoking gun -- the judge's single, hardly intelligible, and un-directed "yes, sir" at the end of a meeting at which he has repeatedly said that he cannot predict his verdict. "Never, never, never have I said that it will go against" Chevron, the judge said. "They asked me if a sentence would come out. I said, 'Yes sir, a sentence will come out.' For or against? I have never said anything." The "bribery plot" Chevron trumpets in its press release has nothing to do with the judge or the court, and instead centers around a separate meeting at which the former Chevron contractor and American businessman discuss payments to a single, excitable man who claims to be connected to Ecuador's ruling party, for access to government contracts for remediation of Chevron's contamination. In fact, the whole episode raises more troubling questions about Chevron than about the judge or Ecuador's judicial process that the company has spent so much time impugning. Chevron denies it had anything to do with soliciting or supporting the apparent sting operation by the former logistics contractor for the company. But Chevron executives have had the video since June, and didn't notify any Ecuadorian or American authorities in advance of its media blitz. Chevron also admits that it paid for the relocation of the former Chevron contractor and his family to the U.S., and has provided other "interim support." Even more suspicious is the fact that Chevron has not allowed reporters covering the story to speak to its former contractor, or the American businessman for whose benefit the meetings were set up. Steven Donziger, an American lawyer who advises the Amazonian communities in the lawsuit, says it "reeks of a Nixon-style dirty tricks operation and Chevron's fingerprints are all over it." "There is no contamination. But if there is contamination, it's not dangerous. And if it is dangerous, it's not ours. And if it's ours, uh, uh... Corruption! Extortion! Defamation! Left-wing tyranny!" This specious "bribery plot" is Chevron's latest attempt to change the subject and delay the ruling in the case. Nothing that Chevron presents in the videos alters the underlying facts of the case. 30,000 indigenous people and campesinos living in the Ecuadorian Amazon continue to suffer a severe public health crisis, including an epidemic of cancer, miscarriages, birth defects, and other ailments. The formerly pristine rainforest and Amazon waterways have been poisoned. And it is due to the fact that the oil company operated using substandard practices that were obsolete in order to increase its profit margin by $3 per barrel. Go see the new documentary film CRUDE, and judge for yourself. The film looks at the unprecedented legal battle in the Amazon from all sides. Besides raving about how thrilling and gripping it is, reviewers have praised CRUDE for its "balance," "depth," "intellectual honesty," and "even-handed manner." 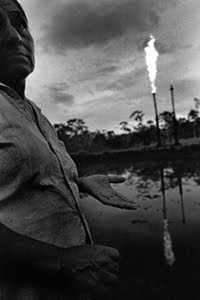 Unfortunately for Chevron, the truth has a way of bubbling to the surface, like crude in the steamy jungles of Ecuador. CRUDE opens in New York on September 9th, followed by Los Angeles, San Francisco, and about thirty more cities across the country. Click here to see when it's coming to a theater near you and visit www.ChevronToxico.com to learn more about Amazon Watch's Clean Up Ecuador Campaign. Ecuador vs. Chevron: Do the Videos Implicate the Judge? The lawsuit, the largest of its kind, has lasted 16 years, pitting U.S. oil giant Chevron against residents in the Amazon jungle of Ecuador. They accuse the company of massive petro-contamination of their communities in the late 20th century and seek $27 billion in damages, an amount that has turned nervous corporate heads worldwide. It is certainly questionable conduct for Nuñez or any judge to be discussing the landmark case with Hansen and the Ecuadorian, Diego Borja, in such cavalier fashion. In a newspaper interview, Nuñez denied that he told Hansen a predetermined verdict; his supporters say it's unclear in the videos, especially given Hansen's tortured Spanish, what exactly Nuñez is responding to. "This is a total trap on the part of Chevron," Nuñez said in an interview with Ecuadorian network Teleamazonas on Sept. 1. He acknowledged the meetings but said the secret videotaping was a setup, and he insisted that bribes were never discussed. Although Chevron insists that it had no part in the secret videotaping, it turns out that Borja has worked for the company as a logistics contractor. "This entire episode reeks of a Nixon-style dirty-tricks operation, and Chevron's fingerprints are all over it," says Steven Donziger, a New York lawyer and adviser to the Ecuador plaintiffs. In his TV interview, Nuñez said that if Chevron "sent an employee" — the contractor Borja — that may mean a crime has been committed, since the law forbids him from meeting the parties in the lawsuit. Nuñez is not present at another meeting in the videos in which men claiming to be influential members of Correa's ruling Alianza País Party lay out a brazen bribery conspiracy. They tell Hansen and Borja that $3 million in payoffs will be required to land a cleanup contract, divided evenly among Nuñez, Correa's office (including, said one of the men, the President's sister) and the plaintiffs. The Chevron complaint also fingered Correa's chief legal adviser, Alexis Mera, in the scheme. At a press conference on Sept. 1, Mera denied being involved and suggested that Chevron was simply trying to divert attention away from a case it knows it will probably lose. "The government won't succumb to these types of provocations," he said. The Correa administration said Tuesday that while it had thus far seen no evidence of government corruption in the videos, it would investigate the matter "thoroughly, aggressively and fairly." On Wednesday, Ecuadorian justice officials announced they were opening an investigation into the possible government corruption, as well as whether the videotaping had violated laws. In any event, the scandal promises to delay the completion of a trial that has already spanned two decades and two continents. It began in the early 1990s in New York, after settlers and indigenous tribes in the Amazon oil towns of Coca, Lago Agrio and Shushufindi accused Texaco — which was bought by Chevron in 2002 — of recklessly dumping crude and wastewater into their lakes and rivers, seriously damaging the public health and livelihoods of tens of thousands of people. A court-appointed expert estimated the total damage to be a remarkable $27 billion, a figure Chevron says is baseless. Ironically, Chevron in 2003 requested that the trial be moved to Lago Agrio, believing the conservative Ecuadorian government at the time would be more sympathetic. Indeed, in 1998 the government had declared that Texaco's $40 million cleanup of the sullied Amazon area was satisfactory. But three years later, Correa was elected, and Chevron has complained ever since that his administration has interfered in the case and prodded the judges overseeing it — including Nuñez, who took over last year — toward the plaintiffs. Chevron executives have been under increasing pressure from shareholders who are fearful of an unfavorable verdict. But the scandal probably has the Correa administration chafing as well, especially since a tainted legal system could compromise its efforts to win most-favored-nation trade status from the U.S. Congress this year. Either way, says Chevron spokesman Kent Anderson, Nuñez "needs to [recuse himself], and his past rulings need to be annulled." The plaintiff's lawyer, Pablo Fajardo, says the videos are an entrapment of Nuñez and show Chevron attempting to "undermine the trial process so the company can avoid paying a judgment." Says Donziger: "The bottom line [remains] that Chevron is responsible for wrecking Ecuador's rain forest. Nothing Chevron has presented in these videos changes these underlying facts one bit." Chevron's bet is that the videos will at least change international opinion about the court that's weighing those facts.